The Choice-Select boxed beef spread, commonly referred to as the Choice-Select spread, is the difference between wholesale boxed beef cutout values for the U.S. Department of Agriculture’s (USDA) Choice and Select quality grade carcasses on any given day. The cutout value is not a carcass price, but represents the value of a carcass based on the value of individual cuts on that day. A beef carcass is fabricated into various primal cuts, which are then sold as boxed beef. The boxed beef cutout value is a composite value based on primal cut value as calculated from the price of individual cuts, along with the value of lean trim and fat. Individual prices for specific cuts ultimately drive cutout values for the different USDA quality grades and thus the difference reported in the Choice-Select spread. This Fact Sheet discusses calculation of the Choice-Select spread as well as supply and demand factors which widen or narrow the Choice-Select spread. Additional discussion centers on how the Choice-Select spread reflects cattle quality and packer demand for certain USDA quality grades. The beef carcass is divided into seven primal cuts, specifically the brisket, chuck, flank, loin, rib, round, and short plate. USDA calculates a carcass cutout value by quality grade based on the percentage yield contribution (PYC) of each primal cut to the carcass cutout value as shown by column (1) in Table 1. Primal values are calculated from subprimal prices. As an example, the loin primal value is a weighted average wholesale price of its associated subprimal cuts, including tenderloins and strip steaks that are available at grocery stores and restaurants. Negotiated prices for subprimals of differing quality grades reflect consumer demand as well as supply factors and directly impact the overall value for the specific USDA quality grade’s cutout. Mandatory Price Reporting provides subprimal prices as negotiated between packers and wholesalers. PYC is multiplied by the value for a quality grade [columns (2) and (4) in Table 1] to obtain the percentage weighted quality grade value [shown in columns (3) and (5)]. For example, the choice rib primal contributed $36.72 ($324.69 * 11.31 percent) to the composite cutout value of a USDA Choice carcass during the week of November 1, 2013. The composite cutout value for each quality grade is calculated by multiplying each primal PYC by the corresponding primal’s cutout value and then summing across the 7 primal cuts. The Choice-Select spread is then calculated by subtracting the Select composite cutout value from the Choice composite cutout value. Table 1. Primal Value Contribution to Carcass Value and Calculated Choice-Select Spread. Note: Values are for the week ending November 1, 2013. The difference in value of Choice beef cutout value and Select beef cutout value is driven by the two identifiable markets for these quality grades. Choice and Select are two of the four quality grades used by the USDA to classify the amount of marbling (intramuscular fat) and maturity of beef carcasses. Carcasses that grade Select have less marbling than their Choice counterparts. In order to grade Select, cattle must be between nine and thirty months of age. Cattle grading Choice can be up to 42 months of age, although in practice, most cattle that grade Choice or Select are less than thirty months of age. The Choice-Select spread is the focus of attention since roughly 86 percent of all beef graded falls into one of these two grades. Moreover, the tradeoffs between Choice and Select are highly related since cattle that fail to grade Choice typically grade Select, thereby changing the supply of both simultaneously. There are two separate but connected markets for Choice and Select beef with separate and unique supply and demand curves for each quality grade. For example, Lusk et al. found that Choice and Select quality grades are substitutes during winter at the wholesale level, but that Select beef is not a substitute for Choice beef during the spring and summer, i.e. “the grilling season.” Anything that shifts the supply or demand curves for either Choice or Select beef can impact the Choice-Select spread. Choice beef contains a higher degree of marbling than Select beef and can typically be attributed either to differences in genetics or to additional days on feed. These differences result in a product that is more expensive to produce, which is reflected in a supply curve for Choice beef that is different than for Select beef. Even within a quality grade, sub-markets can exist for different ranges of the grade. Changes in technology and improved education of USDA graders have resulted in an increased supply of Choice carcasses. Since 2008, Choice beef accounts for approximately 64 percent of total pounds graded as compared to 57 percent from 2000-07. Total pounds of beef graded Select have fallen to approximately 32 percent since 2008 compared to 39 percent during 2000-07. These improvements in quality grading have also resulted in market changes that are not fully reflected in USDA reported cutout values. There is increasingly a divide between the upper two-thirds and lower one-third of the Choice market. This change is not reflected in the USDA reported cutout values, but it allows many retailers to offer USDA Choice beef in their meat cases that would have previously graded as USDA Select plus. The performance of these two sub-markets for Choice beef is important in explaining the total strength of the Choice composite cutout value even though USDA reports do not reflect the presence of these two sub-markets. Seasonality of cattle production also impacts the Choice-Select spread (Figure 1). Fewer cattle grading Choice in the spring combined with increased demand for steaks produced from the rib and loin primals going into the summer leads to a wider Choice-Select spread. A tightened supply of Choice grading cattle in the spring reflects younger cattle being placed in feedlots in the fall. The Choice cutout value normally increases faster than the Select cutout value during this period, resulting in a wider Choice-Select spread through the summer grilling months. In July, the Choice-Select spread begins to seasonally narrow with an increase typically occurring in October through the end of the year. The wider Choice-Select spread in October through the end of the year is primarily a result of seasonal demand for Choice loin and ribs (middle meats) during the holidays – demand that is not shared by Select middle meats. The stronger than usual spread during the summer of 2012 and 2013 suggests that the Choice-Select seasonal pattern is changing, possibly due to the previously discussed Choice sub-markets. 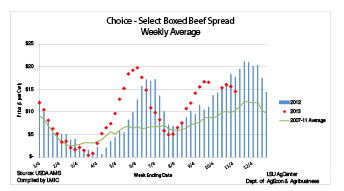 Figure 1, Choice-Select Boxed Beef Cutout Value Spread. Source: USDA Agricultural Marketing Service, Compiled by Livestock Marketing Information Center. A widening (narrowing) Choice-Select spread provides incentives for increased (decreased) production of Choice beef relative to Select beef. This is partly a reflection of the fact that cattle usually must be kept on feed longer to achieve the USDA Choice quality grade which results in a higher cost of production. The value of the Choice-Select spread is a signal from packers to cattle feeders that the marginal cost of keeping cattle on feed longer will be rewarded through higher fed cattle prices. Differences in the Choice-Select spread are driven by value differences in the loin and rib. There is little difference in between Choice and Select values of the other primals (Figure 2). This reflects the importance of these two primals regarding aggregate beef demand. With approximately half of total U.S. food expenditures occurring away from home, improved beef demand at restaurants that feature Choice steaks from the loin and rib primals can improve the value of the Choice cutout and widen the Choice-Select spread. 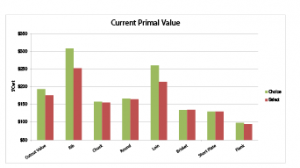 Figure 2, September 2013 Primal Value. While there is often small or no differences between Choice and Select value for other primals, the value of these primals is an important part of the overall carcass cutout value. The primal cuts of the chuck and round experience seasonal strength during the fall and winter months, while the brisket primal experiences its highest prices in the winter months. Weakness in demand for primals impacts the value for both the Choice and Select composite cutouts and can result in lower fed cattle prices. Year-on-year comparisons in terms of subprimal price or primal value can be important barometers to indicate the strength of demand for these meats cuts. However, beef production, prices of competing meat products, weather, and income should also be taken into account, as demand for steaks does not occur in a vacuum, but must compete against fish, pork, and poultry for consumers’ food dollars. Some primal cuts, such as brisket, chuck, and round, are popular in the U.S., but these primal cuts are often in higher demand in other countries, including Canada, Japan, Mexico, and South Korea. The strength of export demand for these primals is reflected in the price of specific subprimal cuts, which in turn impacts primal and cutout values and, ultimately, the price of fed cattle. U.S. beef exports have accounted for approximately 8 to 10 percent of domestic U.S. production in recent years, providing a significant boost to fed cattle prices. Table 2 illustrates export demand for specific primals by major U.S. trading partner. As not every country listed below prefers Choice for a specific primal, this provides additional support for the value of the Select cutout and results in little difference between the Choice and Select primal value. Table 2. Export Demand for U.S. Beef Primal Cuts. The beef industry maximizes value by providing products that consumers most desire. The USDA quality grades of Choice and Select are indications of the degree of marbling which provides tenderness and taste that consumers enjoy. A widening (narrowing) Choice-Select spread indicates that consumers are willing to pay more (less) for Choice beef relative to Select beef. Consumers can and do substitute Select beef products for Choice beef products when the industry offers too much Select relative to Choice but there is a loss of value to the industry as consumers will be willing to pay significantly less for products that are less valuable to them. The Choice-Select spread helps the industry understand and respond to value signals. While the Choice-Select spread reflects packer demand for certain types of cattle quality, these incentives are not always fully communicated through price signals, depending on the pricing system used to procure fed cattle. Pricing fed cattle on a live or dressed basis makes it difficult for the packer to fully account for the quality of the animal. This may result in a lower price for the cattle producer since the packer faces uncertainty regarding carcass quality until after the animal is slaughtered. Alternatively, a grid pricing system provides stronger incentives, via premiums and discounts in the grid, for producers to produce high quality fed cattle possessing the characteristics desired by consumers. A deeper discussion of grid pricing is available in Feuz, Ward, and Schroeder and Ward, Schroeder, and Feuz. In short, grid pricing transfers risk and uncertainty regarding the carcass quality and its value to the producer, but the producer can also be rewarded for higher quality cattle that meet demand from consumers. The Choice-Select spread is an important indicator in the strength of demand and relative supply of two separate markets for beef: the USDA Choice market and the USDA select market. Prices for specific beef cuts ultimately impact the value for the Choice and Select composite cutout values which result in a widening (narrowing) Choice-Select spread. Some primals often exhibit little difference between Choice and Select quality grade levels and therefore have little impact on the Choice-Select spread. International demand can be an important factor in determining subprimal prices which in turn impact primal cutout values and the overall carcass cutout value. The Choice-Select spread also indicates packer demand for cattle quality types as it reflects the relative strength of these two similar, but separate consumer markets. Feuz, D.M., C.E. Ward, and T.C. Schroeder. “Fed Cattle Pricing: Grid Pricing Basics.” Oklahoma State University Cooperative Extension Factsheet AGEC-557 (2003). Lacy, C. “Relationships Affecting the Choice-Select Spread.” University of Florida Beef Cattle Short Course, Gainesville, FL, May 2-4. Lusk, J.L., T.L. Marsh, T.C. Schroeder, and J.A. Fox. “Wholesale Demand for USDA Quality Graded Boxed Beef and Effects of Seasonality.” Journal of Agricultural and Resource Economics 26(1):91-106 (2001). U.S. Department of Agriculture, Agriculture Marketing Service. USDA Daily Boxed Beef Report. Available at: http://www.ams.usda.gov/AMSv1.0/getfile?dDocName=STELDEV3102138. Ward, C.E., T.C. Schroeder, and D.M. Feuz. “Grid Pricing of Fed Cattle: Risk and Information.” Oklahoma State University Cooperative Extension Factsheet AGEC-561 (2004).